TYNEMOUTH’S Danny Hockborn proved the pick of the North East bunch at the Axis Northern Cup, as a touch of professional squash glamour arrived in Newcastle. Some of the top young pros from around the country descended on Northern Squash Club, with $1000 in prize money – and precious PSA ranking points – up for grabs in a star-studded competition, sponsored by Steve Davis’ Axis gym. And Hockborn found top form to reach the final of the A event, where the precociously-talented 19-year-old was edged out 3-1 by Nottingham’s Chris Fuller, after a pulsating match. 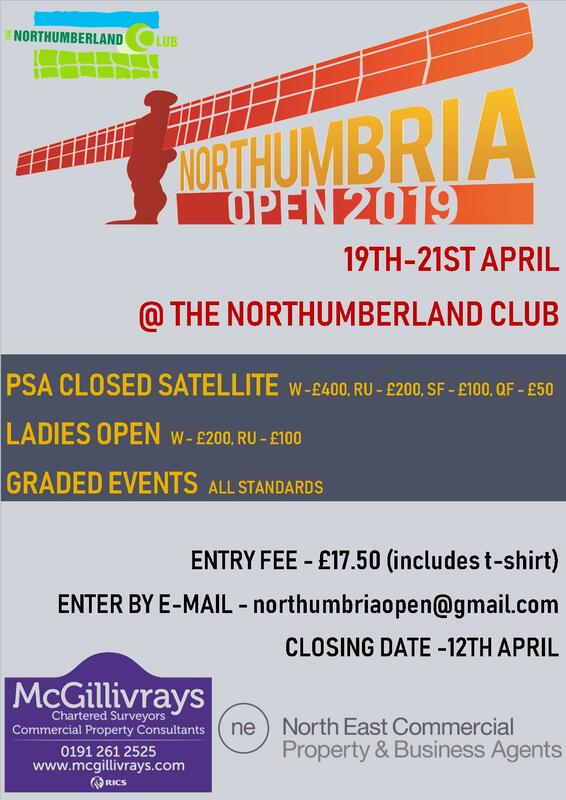 Tournament organiser Liam Gutcher, No 1 at home club Northern, exceeded expectations with a fine run to the last four in this PSA-graded event, while club-mate Matt Hardy reached the quarters with a convincing win over Jesmond’s Peter Kullar, who went on to dominate the A Plate. Gutcher kicked off with a 3-0 win over Nick Pugsley on the Friday night (11-6, 11-3, 11-4), then triumphed 3-1 over Jonny Maloney in the second round – an impressive result considering the Buckinghamshire player had knocked out the No 2 seed, Jonathan Geekie, the night before. However Northern’s No 1 had many pundits’ pre-tournament favourite, Fuller, to face in the semi-finals and although the althletic Gutcher put up a strong fight, Fuller came through 3-0 to book his place in Sunday’s showpiece final. Hardy, meanwhile, who had lost to the consistent Kullar in a team match just two weeks before, prevailed in a tight first game (14-12) before dominating the last two (11-6, 11-4). Hockborn lay in wait in the quarters, though, and he needed to find his full range of shots in seeing off Hardy in a tight 3-0 – 11-9, 11-7, 13-11. The A Event proceedings had kicked off in fine style on the Friday night, with ex-pro Paul ‘Lord of Westoe’ putting on a superb show against No 1 seed Alex Phillips, who had made the long journey from the Isle of Wight. The 25-year-old’s attacking style and the Lord’s magical court craft made for an enthralling encounter in front of a bumper crowd – Lord winning the first 13-11 before some marathon rallies saw him edged out in the next three – 11-6, 11-4, 11-9. It was clearly going to take something special to beat world No 143 Phillips, who won more than a few fans with his back-court volley drops and unchanging laidback demeanour – but Hockborn proved to be a man inspired in their epic semi-final five-setter. The Hartlepool starlet, who has been playing for Tynemouth this season, took the first 11-9 and in a match which proved to be a real shootout, these two attacking players took turns to win the next two 11-4 before the close games resumed once more. Philips eased back to 2-2 with an 11-8 win in the fourth, and had a match ball in a tense finale in the fifth before going down 13-11 in a match which neither deserved to lose. Hockborn stayed in top gear to take first blood in a superb Sunday afternoon final, winning the first 11-9 against the world No 167. The scores in the next three – all won by Fuller – 11-3, 11-5, 11-2 – do scant justice to some brilliant squash from the Tynemouth No 1 – especially those forehand return serve crash nicks – and some punishingly-long rallies. But Fuller’s athleticism, a sublime straight drop, admirable calmness throughout and sheer consistency deservedly won the day as he walked off with the £100 top prize. In the A Plate, the Northumberland Club’s Kullar played well to see off Newbiggin’s David Jackson 3-1 in the semis, and then found top form to beat Mike Mackay of Northumbria Blues 3-0 in the final (11-4, 11-6, 13-11). The B event trophy is off to foreign shores as Tenerife’s Aitor Chinea – here in Newcastle to study for six months – proved a worthy winner. The Spaniard – in the top 5 in his country at Under 19 level and a regular on the European junior circuit – beat Northern duo James O’Neill (3-1) and Andy Smith (3-0) on his way to the semis, and then beat No 1 seed and last year’s winner Jonny Honeyman 3-1 to book his place in the final. Newcastle University student Chris Garner was the other finalist – he booked his place by beating three Northern players – Sam Broughton, No 2 seed Cai Younger (last year’s runner-up) and Marcus Campbell (another 3-2 epic). Campbell had triumphed 3-2 himself over Alex Robertson in the previous round, so he certainly got plenty of court time for his entry fee! The irrepressible Garner struck first in the B final (11-9) but Chinea – a stylist who knows how to attack the ball when needed – then got into his rhythm and took the next two fairly convincingly at 11-7 and 11-5. The Spaniard was so close to victory when he appealed unsuccessfully for a stroke at 10-7 up in the fourth, and in the end he had to dig in to see off a superb fightback from the fleet-footed and determined Garner, before eventually closing it out at 15-13. Cai Younger eased through the B Plate with 3-0 wins over Sam Broughton, Lewis Wake and Northern clubmate Karen Heron – who had herself prevailed in two 3-2 nail-biters against clubmates James O’Neill and Gary Law to reach the final. Chester-le-Street’s Tom Beresford proved too strong for all-comers in the C event – he saw off Northern juniors Tegan Younger (3-1) and Jack Cornell (3-0, the No 1 seed) then Peter Windram 3-2 in the semi-final (13-11, 11-13, 11-6, 7-11, 11-8). Tim Barker – one of Northern’s fastest improving youngsters – put up a strong fight against Beresford in the C final, losing 3-1. Barker had powered his way to the main event without dropping a game against Steve Drummond, No 2 seed Alan Morgan and the ‘Incredible Diving Man’ Joel Birch-Machin in the semis. 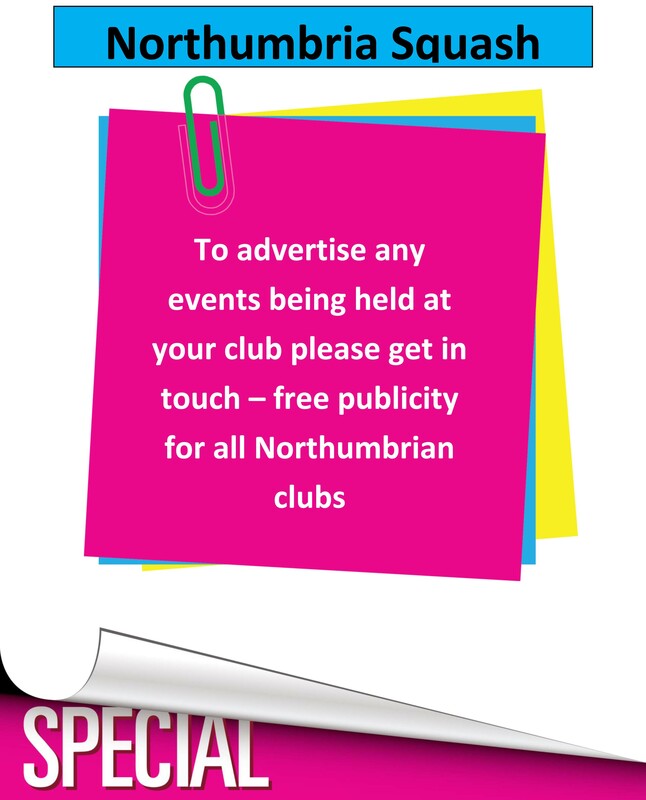 In the C Plate, Northern’s Gordie Robertson was edged out 3-2 in the final by Alnwick’s Morgan, who went on the attack in the fifth to clinch a see-saw encounter 11-3, 4-11, 3-11, 11-3, 11-6. Fitness fanatic Robertson, whose rigorous warm-up consisted of getting out bed before 12pm on a Sunday, had shown his full range of drops, lobs and boasts to see off Jon Pooley (3-2) and Jack Cornell (3-1) to reach the final. The lobtastic Morgan – another who clearly likes to get his money’s worth on court! – had beaten Steve Drummond (3-1), and Dylan Younger (3-2 – 12-10 in the fifth) to reach the C Plate final. Love the comment re Gordie Robertson. Glad you haven’t changed a bit.